Today you are 6 months old. I can't believe it has been half a year since you were born. It has all gone by in the blink of an eye. You still cry a lot. By now I am pretty sure that most of the time you are crying, it is because you are tired but you can't or won't let yourself fall asleep. I try to reassure you that you won't miss out on anything if you do go to sleep, but I think I lost my credibility about that when, back in December, I decorated the Christmas tree while you were taking a nap. When you woke up and saw that the tree had been decorated, I could tell by the look in your eyes that you were saying, "I will never sleep again." That has been very hard for us all. You are becoming more and more interactive. Your face lights up in a smile when I walk into the room. I love that. You "talk" by saying things such as "ba ba ba ba ba" and "goo goo goo goo ga." A month or so ago, you started blowing spit bubbles by buzzing your lips and tongue together. I thought it was your new thing, but then you abruptly stopped doing it. You started it up again a few days ago, with much more gusto than before. I do it back to you, and you laugh like it's hilarious. Speaking of laughing, you are very ticklish. You laugh when we tickle your feet, tummy, underarms and chin. You burst out in peals of laughter every time I take off your shirt. The sound of your laughing is the best thing ever. You are very grabby with your little hands. You grab anything within your reach and shove it into your mouth. You grab strands of my hair and try your best to pull them out. While you are nursing, you send your arm up and grab the skin on my neck. Or you grab my lower lip and try to shove your hand in my mouth. Once you even managed to jam one of your fingers up my nose. Gross. 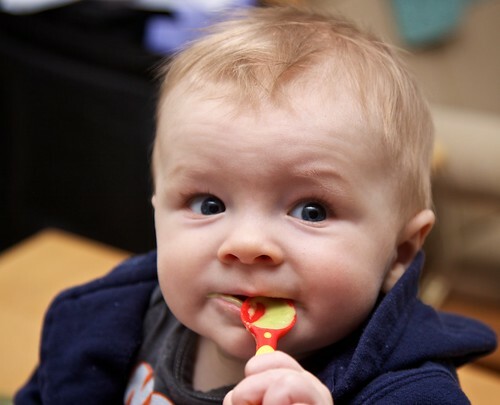 We are celebrating your half-birthday by giving you your first ever solid food. We are giving you some mashed avocado. When you were very, very little and lived in my tummy, you wanted me to eat avocado. I decided that since you liked it so much, it would be your first solid food. Happy 6 month birthday William! We didn't think it was possible that you could get any cuter, but each day that passes you are cuter than the day before!